2 Servings Of Divine Milk Chocolate Cakes With A Moist Molten Chocolate Center, Sprinkled With Icing Sugar. Medium Pizza With Two 345ML Drinks. Marinated Tex-Mex Chicken, Onions, Green Peppers, Jalapenoes, Black Olives & Organo. Small Hand-Tossed Pizza With 345ML Drink. 2 Medium Pizzas, 1.5 Ltr Drink. 2 Large Pizzas & 1.5 Ltr Drink. 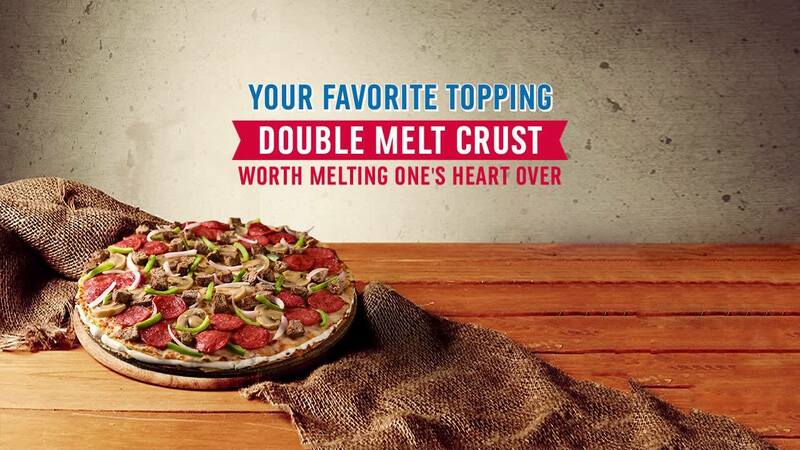 A Delicious Combo Of Onions, Tomatoes, Green Peppers, Mushrooms & Olives. Marinated Tikka Chunks, Onions & Green Peppers. Grilled Chicken, Sliced Cheese, Oregano & Onions Topped With Ranch Sauce. Peri Peri Chicken, Onions, Tomatoes, Green Pepper Topped With Peri Peri Sauce. Spicy Chicken Chunks, Onions, Green Pepper & Fresh Green Chillies. Spicy Chicken With Onions, Green Peppers & Jalapenoes. Medium Spicy Chicken Chunks, Onions, Tomatoes, Jalapenoes & Mushrooms. Mild Spicy Chicken Chunks, Green Peppers, Jalapenos, Onions & Black Olives. Marinated Chicken, Pineapples, Sweet Corn & Crushed Chillies. Grilled Chicken, Sliced Cheese, Oregano & Onions Topped With BBQ Sauce. Marinated Chicken Chunks, Green Peppers, Tomatoes, Onions Topped With Hot Sauce. Pepperoni & Cheese Topped With Sriracha Hot Sauce. Beef, Pepperoni, Onions, Green Peppers, Mushrooms, & Black Olives. Beef, Pepperoni, Mushrooms, Green Peppers & Onions. Onions, Tomatoes, Green Peppers, Mushrooms & Olives. Cheese And Cheese With Some More Cheese. Marinated Tex-Mex Chicken, Onions, Green Peppers, Jalapenoes, Black Olives & Organo. Available Only In Large Size. Marinated Tikka Chunks, Onions & Green Peppers.. Available Only In Large Size. Grilled Chicken, Sliced Cheese, Oregano & Onions Topped With Ranch Sauce.. Available Only In Large Size. Peri Peri Chicken, Onions, Tomatoes, Green Pepper Topped With Peri Peri Sauce. Available Only In Large Size. Spicy Chicken Chunks, Onions, Green Pepper & Fresh Green Chillies. Available Only In Large Size. Spicy Chicken With Onions, Green Peppers & Jalapenoes. Available Only In Large Size. Tandoori Chicken Chunks With Jalapenoes And Onions. Available Only In Large Size. Medium Spicy Chicken Chunks, Onions, Tomatoes, Jalapenoes & Mushrooms. Available Only In Large Size. Mild Spicy Chicken Chunks, Green Peppers, Jalapenos, Onions & Black Olives. Available Only In Large Size. Marinated Chicken, Pineapples, Sweet Corn & Crushed Chillies. Available Only In Large Size. Grilled Chicken, Sliced Cheese, Oregano & Onions Topped With BBQ Sauce. Available Only In Large Size. Marinated Chicken Chunks, Green Peppers, Tomatoes, Onions Topped With Hot Sauce. Available Only In Large Size. Pepproni & Cheese. Available Only In Large Size. Pepperoni & Cheese Topped With Sriracha Hot Sauce. Available Only In Large Size. Beef, Pepperoni, Onions, Green Peppers, Mushrooms, & Black Olives. Available Only In Large Size. Beef, Pepperoni, Mushrooms, Green Peppers & Onions. Available Only In Large Size. Pepperoni, Mushrooms & Beef. Available Only In Large Size. Hawaiian Pineapples & Pepperoni. Available Only In Large Size. Onions, Tomatoes, Green Peppers, Mushrooms & Olives. Available Only In Large Size. Cheese And Cheese With Some More Cheese. Available Only In Large Size. Tandoori Chicken Chunks With Jalapenoes And Onions. 8 Pieces Of Freshly Baked Bread. 8 Pieces Of Freshly Baked Bread Sprinkled With Italian Spices & Served With Marinara Sauce. 8 Pieces Of Fresh Pizza Dough Twisted With A Mix Of Cheese, Jalapenoes & Spicy Chicken Chunks. 8 Pieces Of 100% Chicken Breast, Lightly Coated With Spicy Golden Crumbing. Served With A Dip Of Your Choice. 8 Pieces Of Freshly Baked Bread Sticks Smothered With Mozzarella Cheese, Sprinkled With Italian Spices & Served With Marinara Sauce. A Full 200 Grams Of Oven Baked, Crispy Potato Chunks. 8 Pieces Of Freshly Baked Bread Covered With Nutella Dn Sprinkled With Icing Sugar. 8 Pieces Of Freshly Baked Bread Topped With Cinnamon And Served With Vanilla Icing.